Social media is the perfect platform for brands to inform and engage their customers, in real time. With the ability to actively listen, engage, and respond to customers, social media has become the primary channel for customer engagement. And when anyone with a Wi-Fi connection can be publisher of sorts, brands are now expected to be always-on. The pressure to be “first” and the demand to continually produce content, provides many opportunities to infringe others’ intellectual property rights. If social media is a part of your business strategy, you need to adhere to social media laws and regulations. Here are a few tips to reduce common instances of trademark and copyright exposure. Because who has time to deal with a lawsuit? The internet can feel like the Wild West—photos and videos going viral seemingly overnight. However, it’s critical to note that trademark and copyright laws are the same for both social media and traditional marketing. Since brands use social media to interact with their customers, the content is considered “commercial,” and brands cannot defend against the infringement or misappropriation of another’s intellectual property. And guess what? Employer liability exists. If you have an intern posting on your official company account, they are deemed a company spokesperson, and the employer, not the individual, is liable. Rest assured, with proper training, planning, and oversight, social media infringement liability can be minimized. For both trademark and copyright infringement, a rights-holder can file a takedown request with the social media platform (e.g., Twitter, YouTube) to have the infringing post removed. 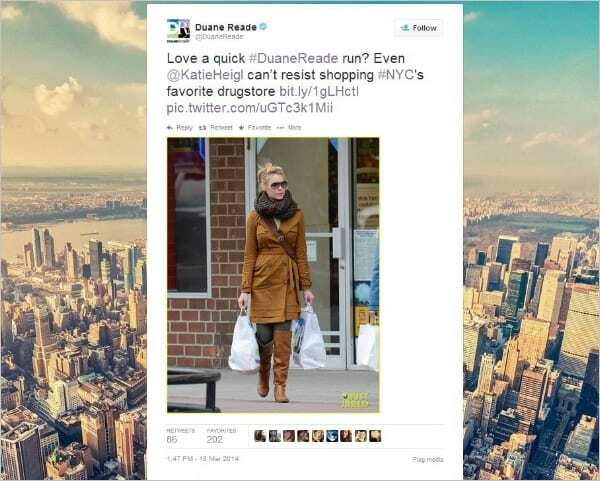 This was the case when drugstore chain Duane Reade posted a paparazzi photo of Katherine Heigl carrying the drugstore chain’s shopping bags. What was seemingly a lighthearted tweet, turned into a $6 million lawsuit. The actress sued on claims that Duane Reade had violated the false advertising provision of the Lanham Act as well as New York civil rights statutes protecting use of likenesses for purpose of trade. Not only did the drugstore chain use her photo without permission, but they tagged her in the post, making the content seem like an endorsement. Duane Reade isn’t the only brand leveraging celebrities and current events in hopes of gaining social notoriety. Arby’s, the second largest quick-service sandwich chain in the U.S., also threw its hat into the ring, so to speak. 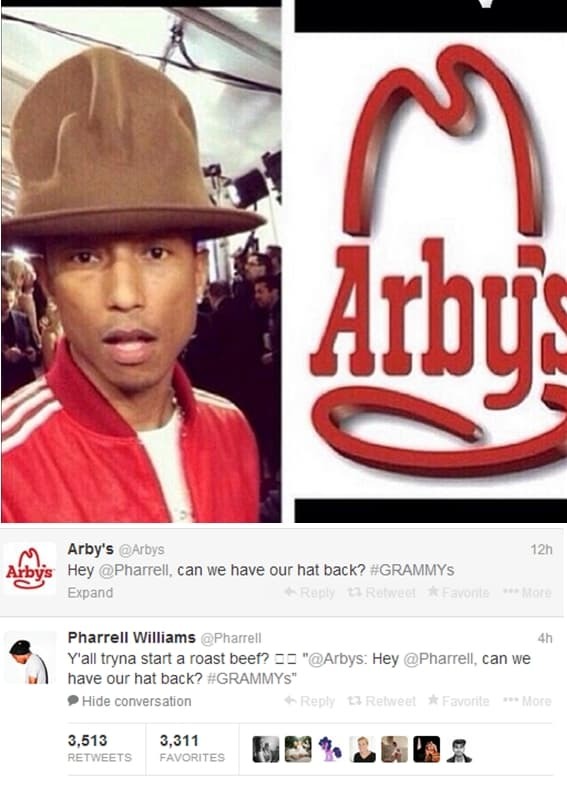 During the Grammy’s, Arby’s drew a comparison between their logo and Pharrell William’s oversized hat. The perfectly timed post was a success, garnering 117 million impressions—the advertising equivalent to $30 million—and turning the sandwich chain into a social media king. This was a gamble which paid off. Instead of negatively reacting to the attention, Pharrell leveraged the press in a positive way and sold his hat to Arby’s for $44,100, all of which went to benefit his charity of choice. But remember, Arby’s is the exception, not the rule. What if Pharrell took offense to the tweet as Katherine Heigl did? While brands have managed to skirt by with similar tactics, it’s smart business to implement the proper training, planning, and oversight, to minimize your liability. What social media platforms does the company use (e.g., Facebook, Twitter, YouTube, LinkedIn, Instagram, Snapchat, Pinterest, Periscope, etc.)? Who has account access and posting rights? What is the company’s review process and posting procedure? Are the proposed words, phrases, and/or designs confusingly similar to the trademarks of others? Do the photos contain others’ trademarked products? If so, remove or blur the trademarks. Obtain permission to use a work on a social media? Ensure all planned uses (especially any off-platform uses) were disclosed to the rights holder. Social media is intended to be just that, social. Accounts that have the highest engagement appear effortless and spontaneous. But anyone has worked in marketing knows that a great deal of planning goes into social media campaigns. While it’s important to have an active pulse on current conversations, this culture of “reactvertising” can strain the balance between legal and marketing. Nonetheless, it is possible to maintain the appearance of spontaneity while giving the legal team a chance to pre-approve posts. Content calendars are the norm in traditional marketing, and it should be the same with social media marketing. Look ahead at predictable holidays and events and approve the content in advance. This gives time to buy, license, or create content to avoid infringing others’ rights. Just remember to monitor these posts as the time gets closer. Many social accounts have looked insensitive by having pre-scheduled content go live after a crisis has occurred. Process. Process. Process. Having a plan in place helps reduce social media liability. Consider designating a team member to follow the company’s social media accounts and provide real-time review for those instances where live posting is truly necessary. To avoid accidental offensive and embarrassing posts on a company account, consider restricting employees from posting to both company and individual accounts from the same device. Additionally, have a crisis plan in case of a social media goof, infringement allegation, or rogue employee poster.